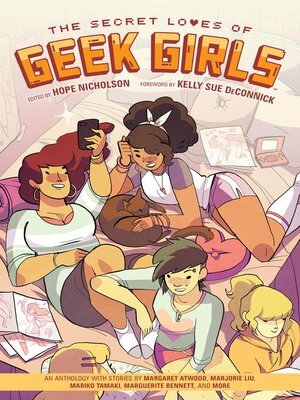 The Secret Loves of Geek Girls is a non-fiction anthology mixing prose, comics, and illustrated stories on the lives and loves of an amazing cast of female creators. Featuring work by Margaret Atwood (The Heart Goes Last), Mariko Tamaki (This One Summer), Trina Robbins (Wonder Woman), Marguerite Bennett (Marvel's A-Force), Noelle Stevenson (Nimona), Marjorie Liu (Monstress), Carla Speed McNeil (Finder), and over fifty more creators. It's a compilation of tales told from both sides of the tables: from the fans who love video games, comics, and sci-fi to those that work behind the scenes: creators and industry insiders.